KEWAUNEE – The Stratford Tigers came out on a mission against undefeated at top-seeded Kewaunee and didn’t let the Storm up for breath. Stratford scored five touchdowns in the first half to open up a huge lead and rolled to a 42-12 victory in a WIAA Division 5 Level 3 state quarterfinal on Friday night at Kewaunee High School. Stratford (10-2) moves on to a D-5 state semifinal next Friday, Nov. 9, against Spencer/Columbus Catholic (11-1). The game will be played at Medford High School beginning at 7 p.m. with a state finals berth at Camp Randall Stadium in Madison on the line. The Tigers lost to Spencer/Columbus 27-7 back in the season opener on Aug. 17, and SC has knocked Stratford out of the playoffs twice since the Tigers’ last state finals appearance in 2008, which capped off a string of six-straight WIAA state titles. Spencer/Columbus last made it to state in 2015, the program’s only trip to Camp Randall, where it lost to Amherst. Kade Ehrike ran 26 times for 234 yards, accounting for about one-third of the Tigers’ offense. He scored on a 65-yard touchdown run in the first quarter to put Stratford ahead to stay. 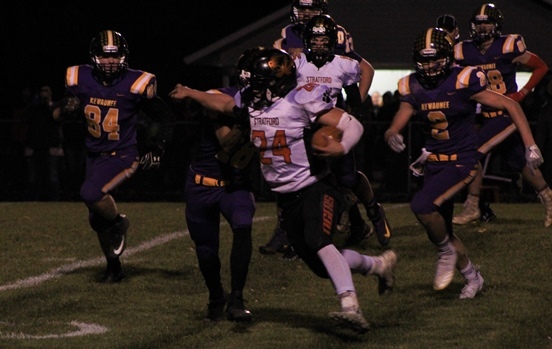 Chase Flink added TD runs of 6, 8 and 15 yards, Ehrike had an 8-yard touchdown run in the second quarter, and quarterback Max Schwabe had a 2-yard TD run for the Tigers. Stratford’s defense was tough again, allowing just eight first downs and 140 total yards in the victory. S – Kade Ehrike 65 run (klck missed). S – Chase Flink 6 run (Two-point try failed). S – Max Schwabe 2 run (Reed Curtis kick). S – Flink 8 run (Ehrike run). S – Ehrike 8 run (run successful). K – Owen Kudick 43 run (PAT missed). S – Flink 15 run (Curtis kick). K – Kudick 5 run (PAT missed). First downs: Stratford 19; Kewaunee 8. Rushing: S 47-335; K 29-74. Passing: S 3-5-13-1; K 8-17-66-2. Total yards: S 348; K 140. Penalties (no.-yards): S 2-5; K 3-16. Rushing: S, Kade Ehrike 26-234, Chase Flink 6-64, Derek Marten 6-23, Eli Drexler 4-14, Max Schwabe 5-0. K, Owen Kudick 20-94, Travis Reinke 3-8, Ryan Carmichael 5-minus 33. Passing: S, Schwabe 3-5-13-1. K, Carmichael 8-16-66-2, Max Hanrahan 0-1-0-0. Receiving: S, Marten 1-10, Drexler 1-5, Ehrike 1-minus 2. K, McCory 4-39, Alex Hewett 2-21, Hanrahan 1-4, Kudick 1-2. Interceptions (defense): S, Drexler, Lance Heidmann. Records: Stratford 10-2; Kewaunee 11-1.